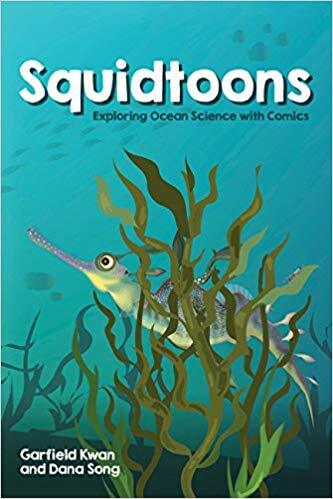 Squidtoons: Exploring Ocean Science with Comics has it all: cute colorful illustrations, quirky kid-friendly humor, and fun science lessons. The NetGalley proof only included the seadragons section but it was enough to see that Squidtoons hits it out of the park with oceanography, biology, and strange sea life. The information is presented in such a way with humorous asides that the facts will stick with children long after they’ve finished reading the book. The vivid pictures with their clear prominence of key animal features will also stay with readers. Squidtoons is too much fun and highly recommended for anyone with kids interested in any of the subjects covered or science in general, and for those parents who have kids who might not be interested in science but who find comics quite the cat’s meow. I think teachers and librarians would find this book in high demand. Highly recommended. I received a sample of this book as an Advanced Reader Copy (ARC) through NetGalley. My opinions are my own. Dive deep into the latest, most interesting (and weirdest!) science about underwater creatures with Squidtoons! These beautifully drawn, educational comics combine fun science facts about marine life, kid-friendly wit, and a strong environmental message. From whale vomit to bone-eating worms, narwhals to sea dragons, Squidtoons presents real ocean science in a series of entertaining, easy-to-understand comics. Venture from the seashore to the deep sea, and learn about the ocean’s diverse life forms straight from the experts.